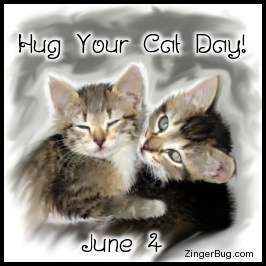 Hug Your Cat Day Glitters and Graphics June 4 is official "Hug Your Cat Day". So send all of your fellow cat lovers these cute comments to remind them that it's time to appreciate all of our feline friends! Kitty Friends need snuggles, so don't forget to give them big hugs today and every day! These comments are designed to be posted on Facebook, Twitter, Blogger or any other social networking site or blog. 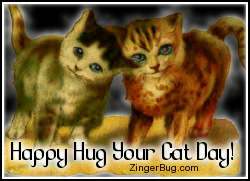 Two-Standing-Kittens - Happy Hug Your Cat Day!